The MAI®2PUMP PICTOR-3D is an exceptionally handy and powerful mortar pump with an external port for 3D concrete printing applications. It can cope with a maximum particle size of 2-3 mm and has a delivery rate of 0.5 to 5 litres per minute. 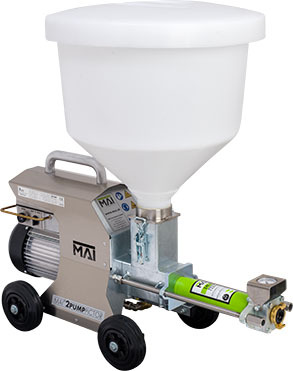 The MAI®MULTIMIX-3D is a special purpose mortar mixing pump that sets new standards in process security thanks to its innovative water and dry material management system. 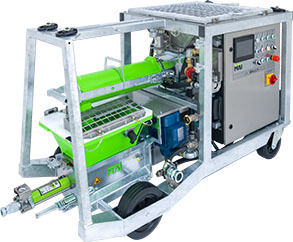 This mobile mixing pump for 3D concrete printing offers a permanent and dependable material consistency flow rate that is adjustable from 2 to 30 l/min via an external interface. 3D concrete printing is the process of synthesising a 3D model in successive layers of material to create an object such as a concrete wall. Building a 3D printed home wall structure is possible, as is 3D printing entire buildings. Talk to MAI about 3D concrete printing and find out more about our cutting-edge technology for 3D printing applications. Easy to use and powerful 3D concrete printing machines that will make a big difference to your construction project.